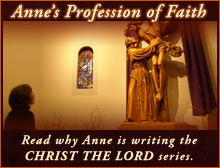 In 2005, Anne Rice startled her readers with her novel Christ the Lord: Out of Egypt, and by revealing that, after years as an atheist, she had returned to her Catholic faith. Christ the Lord: The Road to Cana followed. And now, in her powerful and haunting memoir, Rice tells the story of the spiritual transformation that produced a complete change in her literary goals. She begins with her girlhood in New Orleans as the devout child in a deeply religious Irish Catholic family. She describes how, as she grew up, she lost her belief in God, but not her desire for a meaningful life. She writes about her years in radical Berkeley, where her career as a novelist began with the publication of Interview with the Vampire, soon to be followed by more novels about otherworldly beings, about the realms of good and evil, love and alienation, pageantry and ritual, each reflecting aspects of her often agonizing moral quest. She writes about loss and tragedy (her mother's drinking; the death of her daughter and, later, her beloved husband, Stan Rice); about new joys; about the birth of her son, Christopher; about the family's return in 1988 to the city of New Orleans, the city that inspired so much of her work. She tells how after an adult lifetime of questioning, she experienced the intense conversion and consecration to Christ that lie behind her most recent novels. For her readers old and new, this book explores her continuing interior pilgrimage. "If Rice didn't acknowledge the contradictions between faith and reason, her book would be another simplistic, 12-step testimony. Instead, Rice's memoir shows what true belief really involves. It exacts a price." "This is the very affecting story of a well-known prodigal's return...Called Out of Darkness is the vivid, engaging tale of the journey of a soul into light." 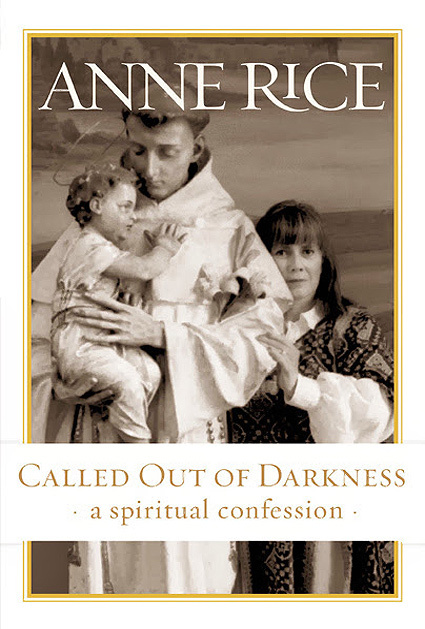 "Called Out of Darkness: A Spiritual Confession is rich in both poetic simplicity and liberating confessionals. This memoir is not to be missed." "I am not a Christian and I normally don’t read what I would call Christian books. They don’t appeal to me, they don’t interest me and I normally pass them by in the bookstore...[But] I picked up [Called Out of Darkness] up this afternoon and it's beyond wonderful." "Rice could rival C.S. Lewis as a popular apologist for the faith." Click for the full review. 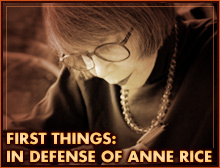 "As a long-time reader of Anne Rice’s, the impetus she presents here makes me want to re-read many of her prior works. I highly recommend this book to anyone who seeks the inspiration and motivation behind the bestselling novels they’ve read." "Nothing short of magnificent...What a real blessing, what a vulnerable sharing." "Even if you don’t consider yourself to be a religious person - even if you are not a Christian - read this book. Anyone can appreciate the message contained in "Called Out of Darkness." It appealed to me especially because it is a thinking person’s approach to faith."